For several years Autonomy showed alternative films in Bridport on a monthly basis. We have come back together now because one of our group has been seriously ill triggering loss of earnings and expensive adaptations to his home for a wheelchair. This event is to raise funds to help with these costs. 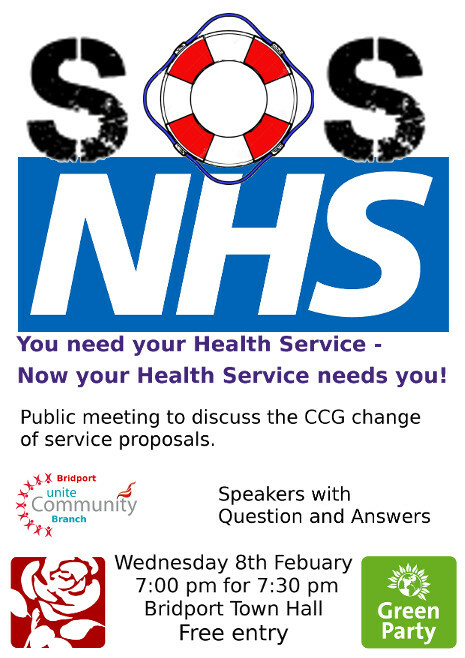 SOS NHS public meeting in Bridport Wednesday 8th February 2017. 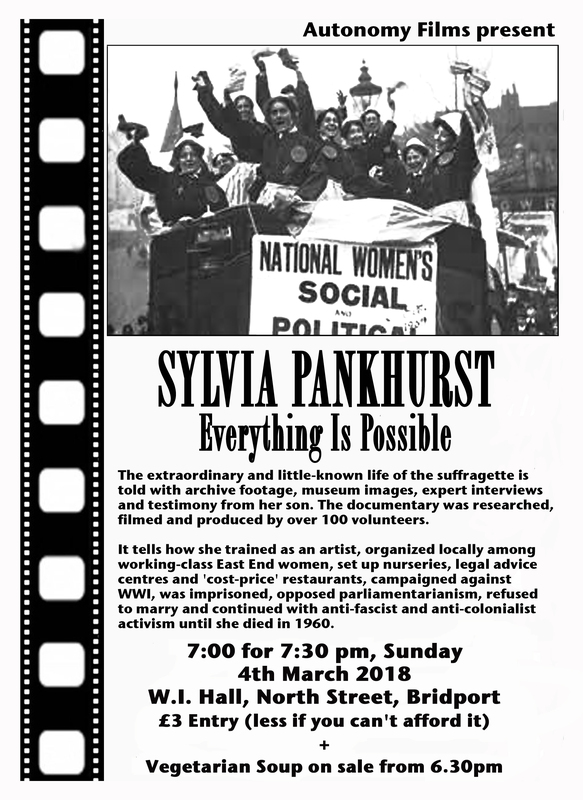 Wednesday 8th February, 7pm for 7.30pm Bridport Town Hall. There will be Q & A when local residents will have the chance to share their experience and concerns. There will be copies of the Questionnaire issued by the Clinical Commissioning Group, to be completed within their ‘consultation’ period by the end of February. If you want to live, come to Dorchester on the 18th May! There will be a demonstration outside the meeting of the Clinical Commissioning Group on Wednesday against the further degrading of healthcare services in Dorset. Come to Vespasian House DT1 1TG at 1p.m. Bring banners and noise-making equipment. The long-running conspiracy to shut down Dorset County Hospital enters a new phase this week. Not only is its A & E and maternity department threatened, but those of Poole Hospital also. Each of these schemes has met with ferocious hostility, followed by sham public consultations, congregations of worthies and posturing by local politicians, especially the odious Oliver Letwin, who has more faces than a town hall clock. 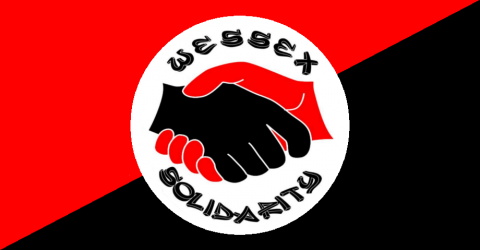 Wessex Solidarity has known for some time that the decision was taken long ago behind closed doors and these shenanigans are purely to defuse the situation until the publicity dies down. Make no mistake about it, we are going to be left with one emergency department for the entire county, and it will serve the wealthy conurbation around Bournemouth. The people of West Dorset, already shafted over public transport, and virtually isolated, will simply not have emergency or paediatric healthcare services within reach. If this is allowed to proceed, people are going to die, some of you reading this, your elderly, your children are going to die, for the greedy parasites who are carving up the N.H.S. we built, merely to line their own pockets. 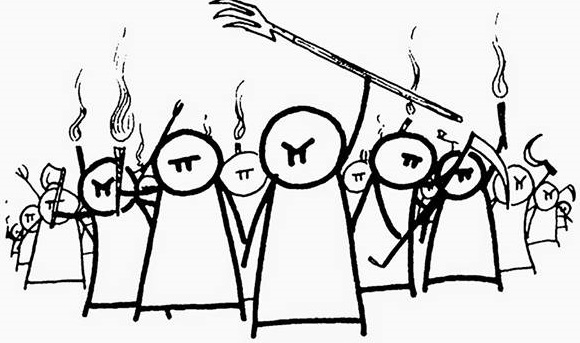 The time for politeness has passed. NOW GET ON THE STREETS! Kingfisher mothers picnic picket in Dorchester. Dorset rejects bureaucrats’ plan to risk children’s lives. 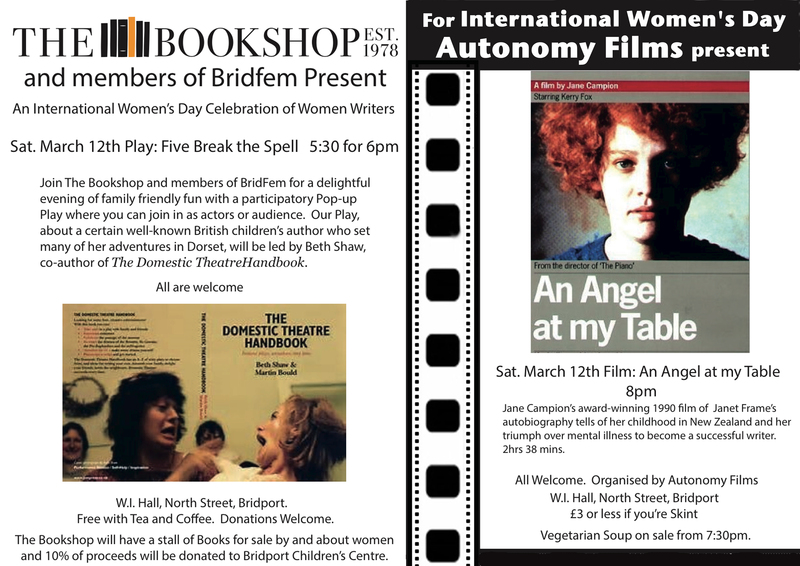 Message from Autonomy films: three fantastic events coming up! All at W.I. Hall, North St. Bridport. International Women’s Day Celebration focuses on Women Writers, all welcome. 5.30 for 6pm Play: Five Break the Spell Join The Bookshop and members of Bridfem for a delightful evening of family friendly fun with a Participatory Pop-up Play where you can join in as actors or audience. Our play, about a certain well-known British children’s author who set many of her adventures in Dorset, will be led by Beth Shaw, co-author of The Domestic Theatre Handbook. The Bookshop will have a stall of books for sale by and about women. Admission Free/Donation, with tea and coffee. Admission £3 or less if you’re skint Vegetarian soup on sale from 7.30pm. 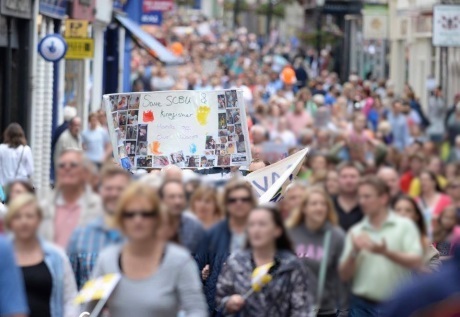 For the second time this year, a couple of thousand Dorset residents jammed the county town of Dorchester to remind the Clinical Commissioning Group that we will not accept cuts to paediatric or maternity services in West Dorset under any circumstances. For some time now, the ordinary people of this county have been at war with those who would pillage the health service we built for ourselves, and leave us at the mercy of private corporations who see us as commodities. Our campaign, started by a determined group of working class women whose only motive was defending their kids, has grown and spread beyond the county. We now have the support of thousands of Dorset residents plus Unite Community, Unison, Industrial Workers of the World, Dorset People’s Assembly, Dorset Eye, Dorset Socialists, Bristol SolFed, the local Zumba community, scaffolders, Daleks, anarchists, snowmen, footballing bears, local media and some politicians. He will have to look elsewhere for his retirement fund then. We’re relieved the Daleks are on our side but we still don’t trust Oliver Letwin. 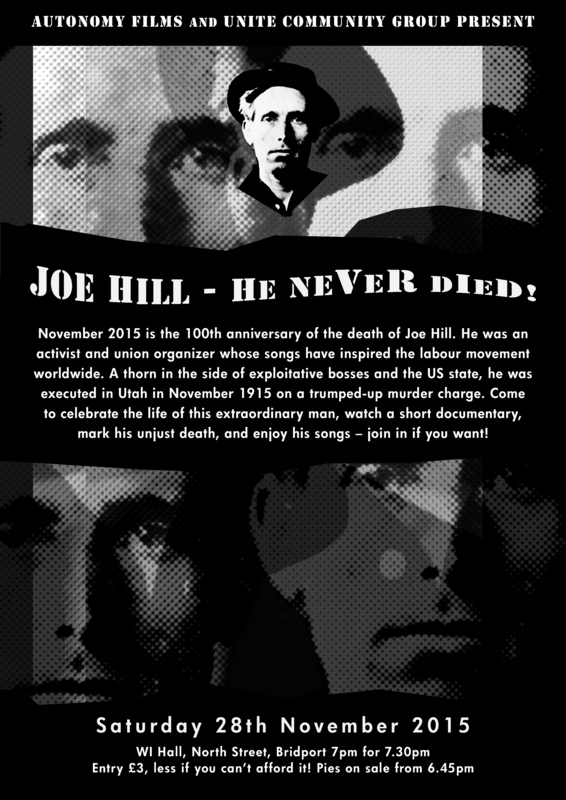 Today, 19th November 2015, is the 100th anniversary of the death of Joe Hill. He was an activist and union organizer whose songs have inspired the labour movement worldwide. A thorn in the side of exploitative bosses and the US state, he was executed in Utah on 19th November 1915 on a trumped-up murder charge. Come to celebrate the life of this extraordinary man, watch a short documentary film, mark his unjust death, and enjoy his songs – join in if you want! Hear Paul Robeson sing about him. BRIDFEM XMAS PARTY 7 p.m. The Snug at The George, South Street, Bridport, 6pm £8 including nibbles, followed by discussion about Women and Xmas (Self-defined women welcome).